My great-grandmother on my mother’s side was a remarkable women. She faced struggles throughout her life not unlike those of her mother and managed to if not overcome them make the best of what she had. Frances Knight-Ostrom was the third child of eleven brothers and sisters and four step-siblings. The Knights were a very close-knit family as you will see as their life unfolds. Frances grew up near in Bowmanton, Ontario, a small hamlet where all that remains today are a few houses and the pioneer cemetery where her parents and several other members of the family are buried. Her father was the postmaster, grocer and tailor and also farmed 200 acres near the end of the 19th century. They lived in a frame house as mentioned in the census of 1861. (2) I visited the area in 2015 and walked around the cemetery to locate some of the ancestors. In the census for 1871,(3) Frances is thirteen and living at home with six siblings and two half siblings and her parents. Frances did not marry until 1881,(4) when she was twenty-three years old, which at the time would have been considered late. 29 January 1881 at Cobourg, Methodist Church of Canada, Rev. T. W. Jeffery. In the 1881 census,(5) which would have been taken in April of that year, Frances at twenty-two is registered as married and living right next to her parents. Her husband is Simeon Charles Ostrom, twenty-one and their newborn child Syntha Emma Alberta “Bertie”, who would have been less than one-month-old are present in the house. Over the next years the few years I had trouble tracking Frances and her family but found them in the 1891,(6) census living in St. Mathews Ward of Toronto. Frances is living with her parents, three brothers John, Henry and Benjamin and her sister Jane. Her own children ”Bertie” ​now ten, Frances Gertrude, “Fannie” (my grandmother) nine, Jane Katherine, “Jenny” five, and Florence Victoria May just eleven months old. Florence would die that same year. For some reason her son "Sim" does not appear on the census and I have been unable to locate his whereabouts. He was eight at the time. Their father Simeon Sr. is not in the picture either, but appears on another census. I found Frances in the Toronto directory in the year 1899,(8) living at 622 Queen Street, living above O'Malley's grocery store. She was listed as a widow. Her address was not far from the McEwan family home. Her second eldest daughter also Frances (Fannie) would marry Benjamin McEwan in 1900. Grandparents I would never know. In 1901,(9) Frances was living with her sixteen-year old son Simeon in East Toronto and working as a washerwoman. Sim is listed as a tin worker. Their annual income was $350. Frances was working from home and Sim in a factory. The rest of her family had moved away. She continued to show up at different addresses in Toronto until she and Sim moved out west after the death of her daughter Fannie. Even with her low income she had managed to squirrel away $20 and applied for a land grant in Saskatchewan for her and Sim. I often wonder if Frances knew the truth about Simeon sr. and chose not to acknowledge it to others or did she really think he died. I had always been told that my great-grandmother was a homesteader in Saskatchewan. There was never any mention of Simeon, so I thought he was with her. Once I realised she was alone I wondered would a widow of her age make such a life changing move, after all she was fifty-three when she and Sim moved out west. I would soon discover most of her immediate family moved West. Further research eventually led me to the full story. I will never be sure if she ever knew the whole truth. Fannie, who married my grandfather, Benjamin McEwan died in 1910 in childbirth. She was only twenty-seven at the time and had already given birth to five children, three still living. Frances senior had been very close to her daughter and it was not until after her death that she moved out west with Sim to Cantuar, Saskatchewan to homestead. Most of her brothers and two sister were already there. As was her eldest daughter Bertie and youngest daughter Jenny. There was nothing to hold her to Toronto and perhaps there was promise of a better life out west for her and her son. By 1890 Frances had five children of which she raised for the most part on her own. The death of the youngest in 1891 left her with four. Her father died in 1892, but it appears they have returned to Northumberland prior to his death, while she remained in Toronto. Shortly after her mother went out west with several of Frances siblings. She was left in Toronto to fend for herself with the children she and Simeon had spawned. Was she waiting for Simeon or resigned to the conclusion he had died. It was not uncommon at the time for men to abandon families. I do not know exactly when he left her but it must have been after her pregnancy with Florence. She was born in May of 1890 and Simeon remarried a young woman in Acton, October that same year. His marriage certificate has his age as younger than he actually was and there are several other discrepancies in the registration. This would indicate he consciously chose to be lost to his family. He would also move out west to Alberta and have six more children with his new wife Sarah before she died, only to remarry again and have four more. The grand total fifteen. None of the new families ever knew that their father was a bigamist. It is also probably Frances was unaware and thought her husband had died when he went West looking for work. A sad aside is that Florence died three days after the birth of Simeon's first daughter with Sarah in 1891. During the next few years much would happen. Frances eldest daughter Emma (Syntha) Alberta married in 1902. "Bertie" and her husband moved out West sometime after the 1906 census. Her son Simeon remained with her and helped with the rent. Jane (Jennie) Katherine married in Toronto in 1908 and would move out West as well. Fannie, (my grandmother), married Benjamin McEwan in 1900 and over the next ten year would have six children. Before her death, Frances decided to leave Toronto and move to the West where the rest of her family now resided. Simeon Daniel her only son decided to manage the homestead there with his elderly mother. Sim would marry and have one child. Most of Frances' children and some brothers and sisters had settled not far from where she was in Saskatchewan. Not long after she settled there two of her grandchildren Frances Munro McEwan and Edgar Irwin McEwan were sent to live with her. She would raise these two grandchildren to adulthood. My mother, sister of Frances Munro and Edgar remained in Toronto and lived with the paternal grandparents and three maiden aunts. Frances died in 1943 in Swift Current, Saskatchewan at the age of eighty-six. A life full of challenges and struggles, this woman made do with very little and gave so much to her family. She was a real pioneer. The town of Cantuar was located on Highway #32 northwest of Swift Current and between it and the town of Pennant . The town is long gone and there is only a sign on the railway track. The town existed from 1913 to 1964. The 1921. (12) Census has Frances living in Swift Current with her son Sim, his wife Annie and their daughter Geraldine. I have a Memory Book of Cantuar and inside the cover of the book has a lay of the land the names of the homesteaders or other occupants. 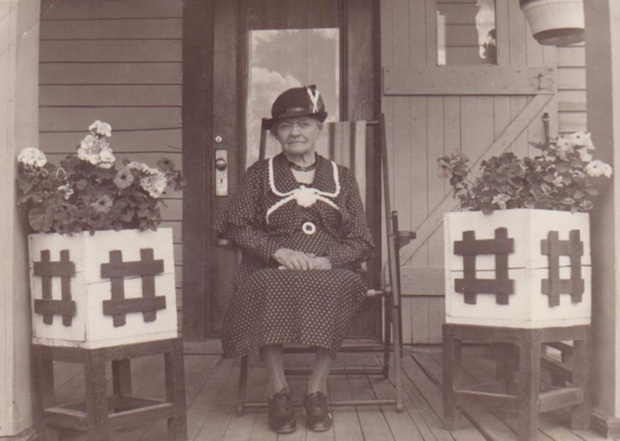 "Mrs. Ostrum was one of the two ladies to take up homesteads in the area later known as the Orillia District. She was the former Frances Knight and with her son Simeon, followed her brothers West from Ontario in about 1906. They first came to Drinkwater where John was homesteading and later came further west to this district. Mrs. Ostrum's brother Harry was homesteading nearby. Sim and his mother both took up a quarter of land and lived together on Sim's quarter until Sim married. At that time, Frances moved north to her quarter where she had a little house built. The building was later moved to the Charles Robertson farm. A young lady arrived, Annie Vickers arrived out west and worked for Mrs. Ostrum. In 1917, Annie became the bride of Sim Ostrum, and they had one daughter Geraldine. Geraldine, Sim and Annie left the farm in the early twenties and moved to Calgary, Alberta. There, Geraldine became well known for her lovely singing voice and was regularly heard on Sunday radio programs. Unfortunately, Geraldine died at a very young age and after her death Sim and Annie moved back to live in Ontario. Sim is now deceased and we were unable to obtain any information about Annie's whereabouts. Frances Ostrum also left the farm in the twenties and worked at housework for neighbours for a time. She later lived in Cantuar and then Swift Current where she passed away." Frances Knight-Ostrom is buried in Mount Pleasant Cemetery in Swift Current, Saskatchewan,(13) her eldest sister Rebecca is also in the same resting spot.